Inside a somewhat shabby but otherwise nondescript building in Kawasaki, just a short walk from Kawasaki Station, is an arcade unlike any other in Tokyo. 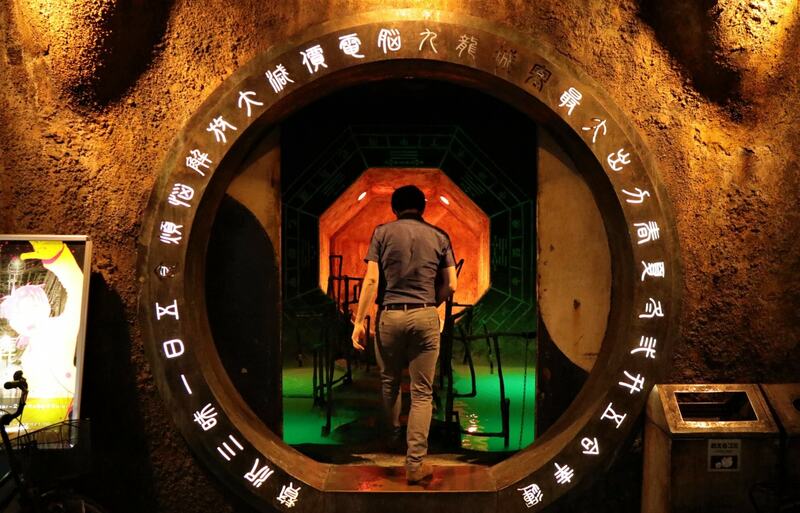 Modeled after Kowloon Walled City in Hong Kong and oozing with cyberpunk personality, Anata no Warehouse might be the coolest arcade most people haven’t heard of. While it isn't new, it's surprising how few people seem to know about this unconventional arcade. 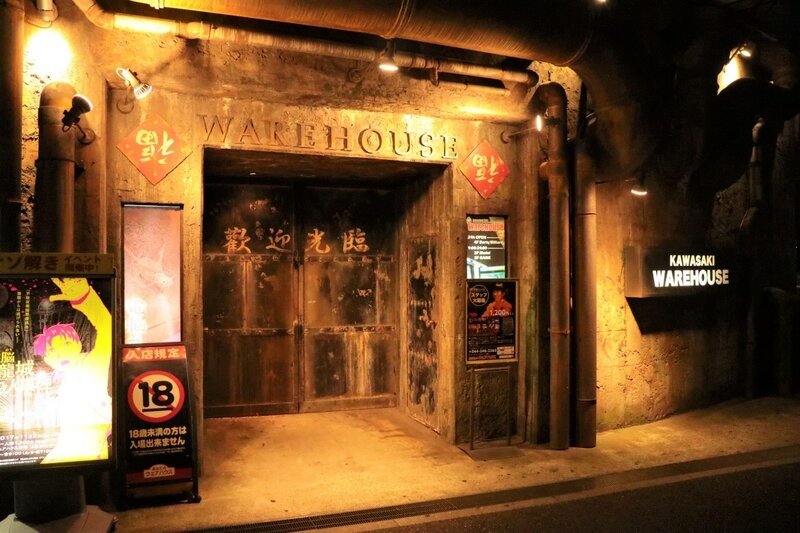 Warehouse was founded in 2009 by Taishiro Hoshino, a former set designer who clearly went to great efforts to painstakingly recreate the mystique surrounding the infamous, now-demolished Hong Kong slum. The outside of the building is purposely distressed-looking, with a menacing door that practically dares passersby to enter. Inside, visitors step into a dimly-lit hallway in a would-be neighborhood, all corrugated iron and tattered old posters. Idle chatter is piped over speakers, which gives the place a sort of eerie, lived-in feeling. Separating the escalator that leads into the arcade proper is a concrete tunnel to the parking garage, with a moat of neon-green sludge spanned by a makeshift stone bridge—oozes personality indeed! The second floor opens into a seedy open-air market, with plucked chickens hanging from a rack underneath derelict houses with laundry set out to dry on rusted, broken balconies. If the decor wasn't enough to clue you in, a sign spells out exactly where you are. But a quick turn of a corner and you’ll see a familiar sight—the bright lights of UFO catchers, plus oodles and oodles of classic and modern arcade games. The second floor is my personal favorite. The UFO catchers contain a wide variety of prizes, ranging from must-have goods from fan-favorite anime series' and games, as well as novelty-sized food items and even ice cream (that can be served up in a cone, via nearby machine). In terms of games, it has popular crowd-pleasers like Taiko no Tatsujin, GROOVE COASTER, Time Crisis, Mario Kart and DDR, as well as competitive fighting games, rhythm games and more. It also has an incredible selection of retro games, including the original 1987 Street Fighter arcade cabinet, as well as the only Bishi Bashi machine I’ve ever seen in Tokyo. For the uninitiated, Bishi Bashi is a three-player collection of weird, goofy and sometimes risqué mini-games that might very well have been a precursor to games like Wario Ware. It’s entirely in Japanese and some of the challenges are hard as hell, but I’ve spent countless nights struggling to reach the final stage with friends. One day! The third floor houses a deafening amount of slot machines and other gambling-themed amusements, such as virtual horse racing, virtual soccer, card games and more. I tend to hedge my bets, but I’m sure if I had an itch, this floor could scratch it. The fourth floor has a somewhat inexplicable change in aesthetic, swapping the grungy, dystopian feel of the previous floors for a no-less-unsettling Grecian marble motif flooded in red lights. Perhaps it’s meant to give off an air of elegance, since the fourth floor is relatively quiet compared to the others. It has popular activities that would be at-home in a dive bar—darts, billiards and table tennis. There’s also an elevator to the upper levels of the building, which house a net café, complete with manga and karaoke! Warehouse is open 24-hours and is free to enter, although you must be 18 or older to go in. While some areas like darts and the net café on the upper floors are available at any time, the arcade closes daily around midnight. If you want to enjoy an evening geeking out with friends in an atmosphere unlike any other, it doesn’t get much better than Warehouse. And don’t worry—while the design is intentionally rough around the edges, the interior and bathrooms are (thankfully) rather spotless! Check out their Facebook page for even more testimonials about how awesome it is, or check out their website via the link below.